Peter and his team welcome you. Grover Butchers Bishop’s Waltham first opened its door in 2004 and is located in the heart of the High Street where the Grover Butchers shop legacy began. 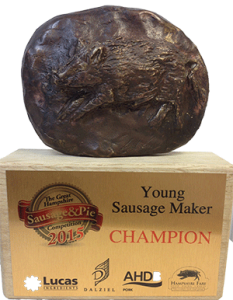 We are very proud to announce our recent achievement of ‘Young Sausage Making Champion of the Year 2015 & 2017’ at The Great Hampshire Sausage and Pie Competition with one of our award winning sausage recipes. The Bishop’s Waltham team received Gold and Silver awards for Grover Butchers Sausages….they are delicious! Parking: Bishop’s Waltham has two large car parks with 1 hr Free Parking.